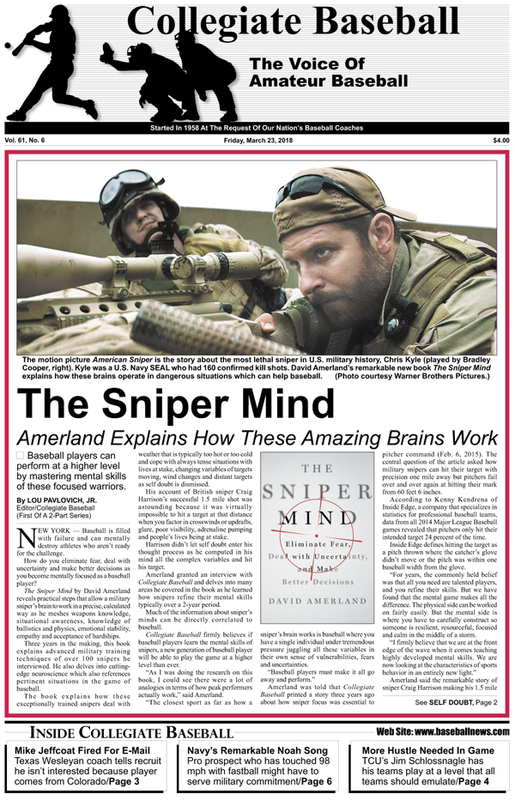 • The Sniper Mind: David Amerland explains how these amazing brains work and how baseball players can perform better utilizing these skills. • Mike Jeffcoat Fired For E-Mail: Texas Wesleyan coach tells recruit he isn’t interested because player comes from Colorado. • Navy’s Remarkable Noah Song: Pro prospect who has touched 98 mph with fastball might have to serve military commitment. • Lou Pavlovich Column: TCU’s Jim Schlossnagle has his teams play at a level that all teams should emulate. • Charlie Greene: Should runner be held on by third baseman? • Editorial: Coaches have an extremely difficult time stopping pot use by players no matter what the consequences. • Jack Dunn: Utilizing defensive roll can help hitter combat fear. • Collegiate Baseball Top 30 NCAA Div. I Poll Presented By Big League Chew: Oregon St. No. 1 with 15-1 record. • Collegiate Baseball’s National Players Of The Week: Casey Mize of Auburn fires the ninth no-hitter in school history along with other amazing feats. • Brigham Young’s State Of The Art Field: This amazing facility features new synthetic turf, but the most valuable upgrade is the heating and drainage system that was installed underneath. The new system can melt 3-4 inches of snow and drain 19 inches of water per hour, allowing more field time during winter months. • Andy McKay On Why Learning Is Vital: Improvements take place when ball players discover knowledge. • Collegiate Baseball’s National H.S. Top 30: American Heritage H.S (Fla.) leads the way with a 9-0 record. • High School Notes: Horizon High School’s (Scottsdale, Ariz.) Eric Kibler celebrates 800th career win. • NCAA Div. 2 Notes: Southwestern Oklahoma State scores 67 runs over 21 innings. . .Dan Wirchansky of Pace fires a perfect game, plus much more. • Junior College Notes: U.S. Air Force Master Sgt. Isreal Del Toro will share his inspirational story as the featured speaker at the JUCO World Series. He was severely injured in 2005 when his Humvee exploded after rolling over a buried landmine, plus much more. • NCAA Div. 3 Notes: King College baseball team and supporters prepare shoe size plastic storage boxes filled with gifts for chronically ill kids, Salve Regina pitcher Patrick Maybach strikes out 15 batters, plus much more. • Ruleball With Rich Marazzi: Fundamental Lesson: Always know where the ball is. • NAIA Notes: William Jessup belts 36 home runs in 24 games to lead all teams on all levels of college baseball, Mobile (AL) sets a new school record for most runs scored in a single game during a 30-2 win over Concordia College Selma, plus much more. To purchase the March 23, 2018 edition of Collegiate Baseball or subscribe, CLICK HERE.